After nearly a decade of environmental assessments, regulatory reviews and engineering plans, the controversial Cape Wind project was blessed by the US government Wednesday and cleared to become the nation’s first offshore wind farm. Approval for the $1 billion, 130-turbine project off Massachusetts is expected to act as a catalyst for many more offshore wind facilities in America, which lags greatly behind Europe in harnessing the tremendous potential of marine-based breezes. While some regulatory obstacles and possible legal action challenging the decision still need to be dealt with, Interior Secretary Ken Salazar said he was confident the project would go ahead. 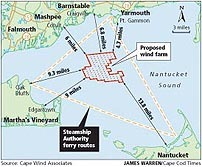 According to The New York Times, supporters of the Cape Wind project — which is expected to generate enough power to meet 75% of the electricity demand for Cape Cod, Martha’s Vineyard and Nantucket Island combined — were pleased with Salazar’s decision. Offshore wind energy has hit the headlines recently, nowhere more so than the UK which recently passed the 1GW threshold. 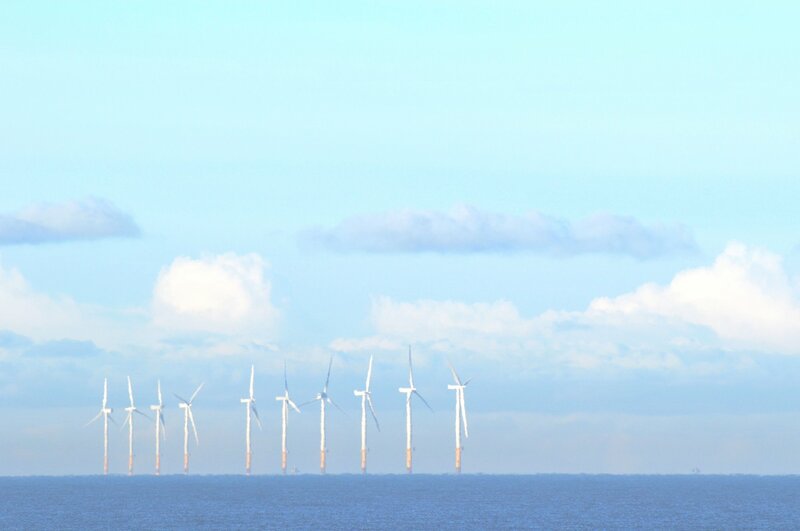 This capacity, according to RenewableUK, a wind and marine renewables industry association, means offshore wind can now keep the lights ablaze in more than 700,000 UK homes. 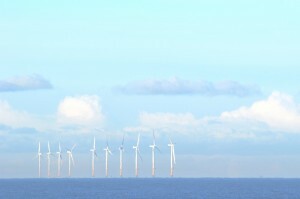 The 1GW level was reached as Dong Energy’s Gunfleet Sands, and E.ON’s Robin Rigg offshore parks were completed. These two farms add to the UK’s portfolio of 11 offshore wind farms dotted around the shores of the country from North Wales to the North East tip of Scotland. However, the association has recently criticised the UK planning system saying that the amount of time it takes for a wind farm to be approved – approximately 27 months – is a waiting period that costs developers huge amounts of money. 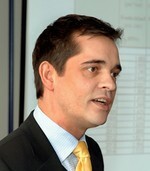 “27 months is nearly two and a half years”, spokesperson Nick Medic said. That wait leaves, “millions of investment locked in the planning system,” he added, reported by Business Green. One thing is sure: with some 4GW of offshore wind farms currently under construction or with planning consent, there will be no let up in the expansion of offshore wind in the UK. Worth noting then, is news that China’s seemingly insatiable appetite for green electricity resulted in a recent announcement that the sea off eastern Jiangsu province will soon boast the nation’s first group of commercial offshore wind farms. China Daily reported Shi Lishan, deputy director of the new energy department under the National Energy Administration, said the four wind power projects include two near-shore 300-MW plants and two 200-MW facilities built on tidal flats. In India, offshore wind is also front and centre in the Economic Times, with a report that the nation’s long coastline, low installation costs and readily available raw materials are attracting the interest of major international energy companies looking for expansion opportunities. If we are to achieve 100% renewables by 2050, as I argued in my previous blog post that we can and we should, there are two major issues that we have to recognise and start acting. Firstly, no more fossil fuel burning plants should be built after 2020 given the long life of such power stations. Secondly, we must use the next ten years to completely overhaul the way electricity is produced, transmitted and consumed in Europe. The fact is that Europe’s current electricity supply structure bears the characteristics of the time in which it was developed, a time when fossil fuels and then nuclear were everything. It is constructed within national boundaries, the markets supporting it are underdeveloped and it is now ageing. Given the international nature of the energy challenges that the EU is facing, it is disappointing that we still do not have an internal market for electricity. We need urgently to establish the free movement of energy in Europe. Climate change, depleting indigenous energy resources, increasing fuel costs and the threat of supply disruptions are washing up on our shores. Over the next 12 years, 360 GW of new electricity capacity – 50% of current EU capacity – needs to be built to replace ageing power plants and meet the expected increase in demand. Europe must use this opportunity to construct a new, modern power system capable of meeting the energy and climate challenges of the 21st century, while enhancing Europe’s competitiveness. The power system must be supported by modern infrastructure technology, research and development and well functioning markets for electricity and transmission in which investors, rather than consumers, are exposed to carbon and fuel price risk. Next year is critical for the EU to prove it is up to the challenge. In 2011, the European Commission will set out its proposals for the 2014-2020 budget which must reflect these new priorities. The budget must include investment in upgraded, extended and interconnected grids, and more R&D in wind technology. During the same year, ENTSO-E, the European Network of Transmission System Operators for Electricity, will set out what will be built in terms of grids until 2022. We are looking forward to the proof that the EU is truly committed to tackling climate change by bringing large amounts of renewable energy online. EWEA’s ‘breath of fresh air’ campaign hit new highs today after the total of wind turbines adopted across Europe reached 500. The UK still tops the league table with 53 turbines adopted, hotly followed by Spain – 36 adoptions – and France – 31 adoptions. Belgium and Germany, which were in second and third position earlier in the week, have dropped to fourth and fifth respectively. Participants are also keenly getting their friends and relatives to vote for their adopted turbine. Currently, the Cabeco da Rainha turbine in Portugal is in poll position with 36 votes. EWEC 2010, where the campaign was launched this Tuesday, is now over and participants are packing up their stands and preparing for the, hopefully shorter, journey home. An impressive 3,000 participants made it to the event while some 1,400 watched the online live video conference. EWEC 2010, where the campaign was launched this Tuesday, is now over and participants are packing up their stands and preparing for the – hopefully shorter – journey home. An impressive 3,000 participants made it to the event while some 1,400 watched the online live video conference.